Wormwood - White Buffalo Trading Co.
​Artemisia absinthium is a perennial herb with sweet smelling, sliver-green, feathery foliage and rows of small yellow flowers. Native to Europe, Asia and Africa, and naturalized to the Americas. Mentioned numerous times in the Bible, used in ancient Egypt, and in witchcraft throughout the ages. Fresh wormwood leaves contain the volatile oil thujone and have been historically added to ethanol and then distilled to create a bitter, green, intoxicating alcoholic beverage called absinthe. Absinthe, an edgy, green-colored, high-alcohol, herbal concoction, was quite popular among many Bohemian writers and artists in Europe during the 19th century, including Vincent van Gogh and Oscar Wilde. Wormwood derives its name from its proven ability in folk medicine to remove intestinal worms. Used medicinally for gastrointestinal ailments and skin problems. Wormwood refers to several species in the genus Artemisia in the Compositae family. It most commonly refers to Artemisia absinthium, a perennial, shrubby herb native to Europe, North Africa, Asia, and North and South America. Wormwood is famous for its extremely bitter taste. Its whitish-grey fuzzy leaves give off a strong, acrid smell when crushed. Today it is best known as the primary additive to the liquor absinthe. Less commonly, wormwood has been smoked, brewed into tea or an oil extract for its mild psychoactive effects. Despite its reputation, wormwood is not a hallucinogen. Like camphor, thujone causes seizures in sufficiently massive dose ranges, which, rarely, can be fatal. AKA: Absinthe; Green Ginger; Madderwort, Absinthe wormwood, common wormwood, Grand wormwood, Old man. The first known reference to wormwood’s usage was in ancient Egypt around 1600 BCE. In ancient Egyptian manuscripts, wormwood is an ingredient in an ink used to write a question to the god Bes, to be answered in a dream. Likely the bitter herb given to Jesus the Nazarene while nailed to the wood cross (or tree or wooden X). Frazer tells of Central European peasants making incense from wormwood, laurel leaves and holy oil in order to remove witches from storm clouds. Often used in the West as an organic pesticide to repel various pests such as ants, fleas, flies, insect larvae, mice, and moths. Historically used to remove intestinal worms, hence its common name. The tiny seeds have been taken internally to expel worms. Used for improving digestion, and to treat stomach, intestinal, liver and kidney problems. Topical oil for sprains, bruises, sore muscles, insect bites and skin irritations. Used for treating anorexia, as it stimulates the appetite. Used to treat malaria and regulate menstruation. Has a soothing and pain-arresting effect. Anodyne, antiseptic, anthelmintic, anti-diarrhetic, antipyretic, narcotic, tonic, vermifuge. Used as an antidote for poisoning by hemlock and poisonous mushrooms. Wormwood is one of the oldest known remedies for worms. Wormwood has been highly valued since ancient times and is mentioned in the Bible ten times. Wormwood has many medicinal properties. The bitter leaves are an important ingredient in absinthe, spirits, wines, vermouth, and other liqueurs. Wormwood is used for stimulating the appetite and improving digestion. Wormwood is a powerful tonic, antiseptic, antidiarrhetic, antipyretic and it regulates the menstruation. It is also used to treat stomach, intestinal, liver and kidney problems. Used for protective spells and protection from dangerous snakes. Induces a mild, hazy relaxation accompanied by a dreamlike or surreal feeling sometimes called “the dollhouse effect.” This refers to the appearance of things as though they are idealized copies of themselves, as if they are from a dollhouse. Other reported effects include a feeling of mental lucidity, stimulation, mild euphoria, and a sense of calm. Contains thujone, a psychoactive terpene that is chemically similar to camphor. The effects of thujone are believed to be mediated by modulation of the GABA(A) receptor; inhibition of the serotonin 5-HT3 receptor may be involved also. Distilled into Absinthe, smoked, oils, tinctures, herbal tea. Stomach upset, increased heart beat, Renal failure. Renal Failure from oral ingestion of pure wormwood oil has been documented. Wormwood oil is poisonous and is for external use only. The few confirmed overdose reports all involve oral ingestion of pure wormwood oil, minimum of 10ml, resulting in kidney failure and hospitalization. Kidney problems: Cranberry juice, apple cider vinegar, medical dialysis. Wormwood is ruled by Mars because of its warming properties. Culpepper, the 17th-century herbalist, considered it a good treatment for bites from wasps, hornets, or scorpions. It is connected to snakes, and it was considered a protector against snake bite. Wormwood is generally good in protection spells and also as a tool for getting vengence through sorcery. In Russia, wormwood was used against the green-haired Rusalki, the female water spirits who would leave their watery abodes every Spring and walk in the woods. If you had to go into the woods when the Rusalki were about, you were advised to carry a handful of wormwood, which they could not stand. Wormwood has traditionally been used in the West to repel bugs from stored clothing, as a strewing herb, and the seeds taken internally in small amounts to get rid of worms (thus the name). Steeped in ink, wormwood would then protect the paper written on from being eaten by mice (because of its bitterness). It is antiseptic. But it is also a constituent of absinthe. This plant grows wild all over Europe and the US. The bitter component of wormwood is an alkaloid, absinthin, which is separate from the essential oil, thujone. Absinthin is removed by tincturing (soaking the plant in water or alcohol). Absinthe cannot be made by tincturing, only by distillation. The plant is rich in essential oils including thujone bitters (absinthum), absinthol, thujyl, bitter sesquiterpene lactones (absinthin, etc), flavonoids, azulenes, and glycosides. Wormwood is also used as an herbal insect repellent. It can repel various pests such as insect larvae, moths and fleas. Wormwood can be planted in soil that is dry. Although it tolerates partial shade it will do much better under a full, bright, sun. The plant loves nitrogen rich soil. Old Europe gives us this bitter species. “As bitter as Wormwood” is an ancient proverb reflecting its flavor. Bitter plants are often good for digestion, and this herb is no exception. Absintium is an herbaceous perennial, with branched, firm, leafy stems, sometimes almost woody at the base. The flowering stem is two to 2½ feet high and whitish, being closely covered with fine silky hairs. The leaves, which are also a whitish-grey with pale green tinge on both sides from the same reason, are about three inches long by 1½ broad, cut into deeply and repeatedly (about three times pinnatifid), the segments being narrow (linear) and blunt. The leaf-stalks are slightly winged at the margin. The small, nearly globular flower heads are arranged in an erect, leafy panicle, the leaves on the flower-stalks being reduced to three or less linear segments, and the little flowers themselves being pendulous and with a yellowish tint. They bloom from June into October. 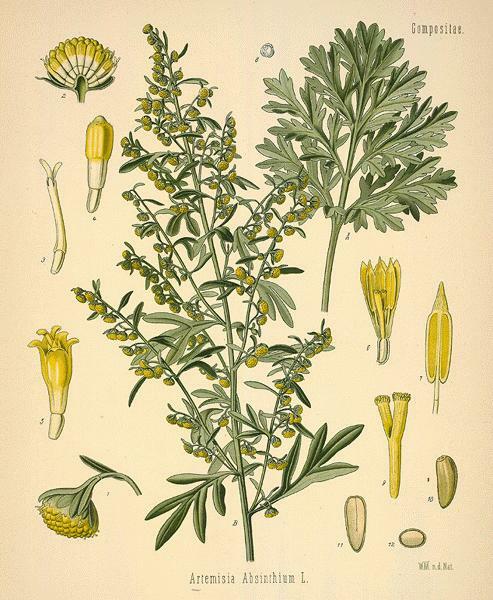 The genus Artemisia consists of 180 species, the most famous of which is easily Wormwood. This herb has been widely used medicinally for many millennia. Its most famous user may have been Jesus. Gall was an infusion of sour vinegar and bitter wormwood, usually given as an anodyne to those who were crucified during the Roman era. This is likely the herb given to Jesus while on the cross. The herb has been used by witches for centuries. Medicinal uses include expelling worms and intestinal parasites, as a pain killer, and for stomach ailments. Bugs of all sorts don’t like it; hence, it also has a long history as a general pesticide and was stored with fur and wool coats to repel moths. Even other plants do not like to grow next to it. In recent times, the silver-blue absinthium has gained an undeserved reputation as a mild hallucinogen when used as the main ingredient in the strong alcoholic drink Absinthe. Native Origin: Europe; also North Africa; Asia; North America. Favorite Habitat: Sunny meadow with sandy soil. Soil Requirements: Prefers nitrogen-rich, moist, well drained soil. Soil pH: Slightly Acid: 5.5 to 7.0. Soil mix: Composted manure/peat moss/sand/ perlite. Deep roots like room to spread. Sun: Filtered sun or part shade. Tolerates full sun, but not heat. Prefers half shade-half sun. Protect from strong afternoon sunshine. Fertilization: General fertilizer monthly to annually. Spacing: Four feet or more. Can get to 6x6 ft.
Pruning: Prune annually to two feet high in fall after flowering i s done. Like sage, wormwood plants need pruning to thrive. Don't worry, they are hardy and will grow back like a weed. Seed Germination time: 12-18 days at 60-70°F. Temperatures warmer than 80°F will inhibit germination. Seed Germination Methods: Flats (plant seeds 1mm deep under peat moss. Do not apply heat. Bottom water or mist. ); Direct sow. Plant Propagation Methods: Seed, cuttings, root division. Cuttings can be placed directly into new potting soil. Seeds have high germination rates the first year, but lose about 50% potency each year of storage. Use fresh seeds. Harvest: Matures at 85 days. Harvest leaves in Summer or Fall during flowering. Harvest flowers if not saving seed. Pests: Aphids; Coleophora absinthii. Plants are loved by both aphids and lady bugs. Lady bugs often hatch their young on wormwood stems. Wormwood will draw in and keep ladybugs in your garden area. USDA Temperature Zones: 3 to 10. Grows from Florida into Canada. Similar Species: Artemisia vulgaris (mugwort): Flowers are different color and configuration than absinthium. NOTE: This plant gives off absinthin, which inhibits the growth of other plants, so it should be grown alone, in deep pots, or used as a natural border. Wormwood is an easy perennial to cultivate throughout the USA. It grows wild throughout the world in all Mediterranean climates and beyond. A hardy perennial, almost shrubby, growing up to 72 Inches (30–180 cm) in height, its spreading branches covered with white, silky hairs. The leaves are much-divided and have an intense, persistent bitter flavor and strong odor. The flower heads are greenish or yellow, 1/8-inch wide, and very numerous. Its seeds are grayish and very small. Native to Europe and sometimes as an escape in North America. Grows in mostly sun to partial shade. If you have hot summers, plant in half shade. Prefers rich, moist, well draining soil with a pH of 5.5 to 7. Surface sow the seeds. For best germination results grow indoors in soil; black earth/peat moss mixture. Transplant outside after risk of frost. Wormwood grows well in dry, sandy soils in a sunny location. The seeds, due to their small size, should be sown in flats where they will not be washed out or packed down by rain. When large enough to be set out they should be planted not closer than 36 inches apart for the first year. The next spring alternate plants should be removed, leaving not less than 30 inches between those remaining. Ripened cuttings may be taken in March or October. These should be set in sandy soil in a shady place and kept moist until well-rooted. It may also be propagated by division of the roots. Weeds should be kept down and the plants should be fertilized very lightly once a year. Start seeds indoors 6-8 weeks before the last frost in your area. Use mist or bottom watering. They should be transplanted outside after danger of frost is over and when they have at least one true set of leaves (after the first two leaves). Put them in a sunny or partly shady spot with dry soil and at a spacing of 2-3ft/60-90cm. Once the plant is established, you can harvest individual leaves and dry and store them to use at once, so your plant will keep producing indefinitely. It can be cut back to 2ft/60cm the second year of its growth. This plant gives off chemicals that prevent the growth of other plants, so it should be on its own, or borders. Sow wormwood seeds directly in the garden in early spring after danger of frost has passed. Wormwood seeds are extremely small, so it is best to barely cover them soil. A good method is to sprinkle them on the ground and just lightly walk over the area to press them into the ground. Thin plants out to 36 inches once they have sprouted. Give wormwood a separate space in the garden. A chemical in wormwood, absinthin, can be toxic to other plants. For this reason, grow it several feet away from other plants and do not plant other plants where you had wormwood the previous season. Wormwood can also be grown in containers, which eliminates this problem, but they stop thriving after a few years of containment. Plant the herb in partial shade. Wormwood can tolerate some direct sun, but thrives in an area which receives half shade. Water as necessary to keep the soil from completely drying out. Wormwood is easy to grow and adaptable, but like most herbs, it needs water during hot, dry weather. Water once or twice a week or more as the soil dries out. Well established plants may not need supplemental water, depending on your locale. Cut back the old, dead foliage in the spring or fall to energize the plant and give it a fresh start. In the USA, this very hardy perennial grows from Canada to Florida (although the Keys are too hot for it). Seed Tray: The seeds are very tiny, so take a pinch between your fingers and very carefully sprinkle them on sterile moist planting medium, then gently firm in with your fingertip. Don’t bury them, because they need light to germinate, but as with any seed, do not put them in direct sunlight. They take a week to ten days to germinate at room temperature (65-70F/18-22C). Over 80F/26C and they may not germinate at all. Direct Sow: Plant in a location that has part sun. Wormwood is very hardy once established. The hotter the summer, the more shade that is required. Cuttings: I have successfully started new plants by taking a fresh cutting and simply planting it in potting soil. Best if old woody growth. Water daily until new growth is noticed. Use stems with old wood. Collect only on a dry day, after the sun has dried off the dew. Cut off the upper green portion and reject the lower parts of the stems, together with any discolored or insect-eaten leaves. Tie loosely in bunches of uniform size and length, about six stalks to a bunch, and spread out in shape of a fan, so that the air can get to all parts. Hang over strings, in the open, on a fine, sunny, warm day, but in half-shade, otherwise the leaves will become too dry; the drying must not be done in full sunlight, or the aromatic properties will be partly lost. Aromatic herbs should be dried at a temperature of about 70 degrees. If no sun is available, the bunches may be hung over strings in a covered shed, or disused greenhouse, or in a sunny warm attic, provided there is ample ventilation, so that the moist heated air may escape. The room may also be heated with a stove, care being taken that the window is kept open during the day. If after some days the leaves are crisp and the stalks still damp, hang the bunches over a stove, when the stalks will quickly finish drying. Uniformity in size in the bunches is important, as it facilitates packing. © Copyright 2012-2019, Datura Don, White Buffalo Trading, All Rights Reserved.